Jeep Wrangler 2012 gets an all-new 3.6L V6 engine and a new 5-speed automatic transmission, which enhance the on-road driving performance - delivering up to 21 miles per gallon, 40 percent more power and 10 percent more torque – while also taking the vehicle’s legendary off-road capability to a new level. New 3.6-liter V-6 engine improves fuel efficiency up to 21 miles per gallon, while delivering 285 horsepower (40 percent improvement) and 260 lb.-ft.
August 21, 2011 ,Auburn Hills, Mich.-	Jeep® Wrangler – the most capable and recognized vehicle in the world – becomes even more capable both on- and off-road for 2012, courtesy of an all-new, more fuel efficient and more powerful 3.6-liter V-6 engine, and a new five-speed automatic transmission – both of which it shares with the award-winning Jeep Grand Cherokee. 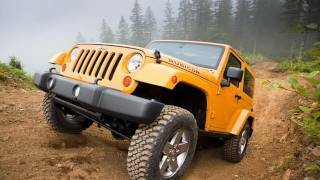 “Jeep Wrangler – the most capable and iconic vehicle in the world – has a new heart but retains the same soul for 2012,” said Mike Manley, President and CEO – Jeep Brand, Chrysler Group LLC. “Our new 3.6-liter V-6 engine gives the ever-capable Wrangler a completely new, more refined on-road driving experience – complete with more fuel efficiency, power and torque. “Available in 2-door and 4-door models and boasting an untouchable combination of efficient design, open-air freedom, significant towing capability, improved real-world drivability, and unique 4x4 systems that deliver unmatched off-road prowess, Jeep Wrangler once again resets the benchmark and offers consumers the ultimate vehicle for any driving adventure,” Manley added. Chrysler Group’s 3.6-liter Pentastar V-6 engine – winner of the prestigious Ward’s 10 Best Engines award – delivers 285 horsepower (209 kW) and 260 lb.-ft. of torque (353 N•m), with greater fuel efficiency. The improvement, when compared to the previous 3.8-liter V-6 engine, is 40 percent in horsepower and 10 percent in torque. Additionally, for refined shifting and greater performance, the Jeep Wrangler migrates from a four-speed to a new five-speed automatic transmission. The 2012 Jeep Wrangler also features the company’s first application of a manual transmission to the Pentastar V-6. The Jeep Wrangler and Wrangler Unlimited will continue to be available in four models: Sport, Sport S, Sahara and Rubicon. Combined with an all-new interior for 2011, the 2012 Jeep Wrangler is virtually all-new over the past two model years and will excite core Jeep followers while appealing to new customers. The 2012 Jeep Wrangler delivers unmatched off-road capability with legendary four-wheel drive and is produced with more than seven decades of 4x4 engineering experience. Wrangler continues to offer a body-on-frame design, front and rear five-link suspension system, live axles, electronic lockers, and is one of the few mid-size SUVs that offers a six-speed manual transmission – in addition to its new five-speed automatic transmission. The new automatic transmission benefits the 2012 Wrangler as much as the new engine with more refined shifting and gear selection. By increasing the number of speeds from four to five, the transmission allows the engine to operate in a more efficient RPM range, which helps increase fuel economy. More speeds also enable the engine to remain in the torque curve, increasing acceleration. 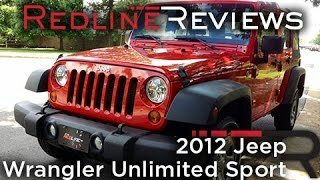 The 2012 Jeep Wrangler boasts a 25-percent improvement in 0–60 mph time, which is now 8.4 seconds. Also, a lower first-gear ratio in the new automatic transmission gives the Wrangler more off-road capability via a lower overall crawl ratio. Jeep Wrangler is now available with more axle gear ratios allowing customers to optimize fuel economy and/or vehicle capability. Wrangler is available with 3.21, 3.73 or 4.10 ratios depending on model. Also, Wrangler offers towing capability up to 3,500 lbs. A best-in-class approach angle of 44.6 degrees, breakover angle of 25.5 degrees and best-in-class departure angle of 40.6 degrees, helps the Jeep Wrangler scale the toughest terrain. 44 rear axle. The Command-Trac® NV241, part-time, two-speed transfer case, features a 2.72:1 low-range gear ratio. In addition, an optional Trac-Lok® limited-slip rear differential provides extra torque and grip in low-traction environments such as sand, mud or snow. The Wrangler Rubicon model features heavy-duty Dana 44 front and rear axles and the Rock-Trac® NV241 two-speed transfer case with a 4.0:1 low-range gear ratio. Rubicon also includes electric front and rear locking differentials, disconnecting front sway bar and 32-inch tires, taking the Wrangler to the highest level of capability. In 2011, Jeep introduced an all-new interior to Wrangler that combines rich styling, versatility, comfort and improved feature use. Highlights include upgraded materials, automatic temperature controls, heated seats, power mirrors and steering wheel controls for vehicle systems. Larger rear windows are engineered for greater visibility. A USB port connects to the media center, 12-volt accessory outlets are located throughout the Wrangler and a 115-volt AC outlet is available to power select two-pronged home electronics. Jeep Wrangler’s signature features include classic round headlamps, seven-slot grille, trapezoid wheel flares, removable doors, exposed hinges, a fold-down windshield and innovative removable and convertible tops and half-doors that allow the Wrangler to retain the brand’s iconic appearance and function. New for 2012, Wrangler Rubicon models now share a body-color hardtop option with the Sahara model, offering a premium appearance. With room for five adults, Jeep Wrangler Unlimited remains the only four-door 4x4 convertible on the market. The 2012 Jeep Wrangler and Wrangler Unlimited are available with an array of safety and security technology features. Standard electronic stability control, electronic roll mitigation, Trailer-sway Control, Hill-start Assist and brake traction control are among two dozen available safety and security features. Jeep safety systems are engineered to improve handling and accident avoidance while providing occupant protection, allowing Jeep Wrangler customers the ability to safely "go anywhere and do anything." The 2012 Jeep Wrangler stays connected with Uconnect systems, including voice recognition, Bluetooth® streaming audio, navigation and SiriusXM Satellite Radio. The Wrangler’s connectivity systems have improved ergonomics by giving the driver control at their fingertips. Intuitive buttons on the front and rear of the steering wheel control a number of features allowing the driver to keep hands on the wheel and eyes on the road. The 2012 Jeep Wrangler underwent millions of durability testing miles during development in the company’s scientific labs, at its proving grounds and on public roads in various climates. The Wrangler’s 3.6-liter V-6 Pentastar engine recorded more than 12 million customer-equivalent miles on engine dynamometers prior to production. Testing was increased by 50 percent compared to previous Chrysler Group V-6 engines, to guarantee a long life against severe conditions and accommodate high-load applications such as trailer towing. Reducing noise, vibration and harshness was a key objective for every engine component and was achieved using advanced computer-aided engineering techniques. As the Wrangler approached production, the company also tested day and night, on- and off-road to put the equivalent of three years of wear and tear on the vehicle in approximately three months time. This accelerated testing occurred on public roads, paved and unpaved, in an attempt to find and fix any issues before the first SUVs were delivered to customers. The test drivers checked all the functional aspects of the vehicle, such as heating and cooling, window operation, convertible and removable hardtop operation and navigation system. 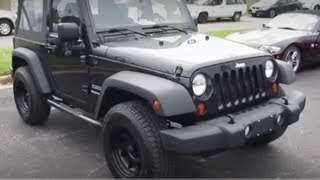 The 2012 Jeep Wrangler and Jeep Wrangler Unlimited are built in the Toledo Supplier Park in Toledo, Ohio. The plant features the flexibility to integrate the all-new powertrain with the addition of new engine carriers and transmission lift equipment. The 3.6-liter V-6 engine is manufactured at the Trenton engine plant in Michigan. The five-speed automatic transmission is produced in Kokomo, Indiana (ITP2), and the manual six-speed transmission is produced in Gaggenau, Germany. Wrangler Sahara and Rubicon models offer a body-color hardtop and fender flares. A new paint process was developed to match the body color to the sheet molded compound (SMC) hardtops that exceeds the corporate quality standards of paint adhesion and UV resistance in the harshest environments. The body and top are painted separately with blended and matched paint to assure color continuity. The Jeep vehicle lineup consists of the Compass, Grand Cherokee, Liberty, Patriot, Wrangler and Wrangler Unlimited. To meet consumer demand around the world, all six Jeep models are sold outside North America - and all are available in right-hand drive versions and with gasoline and diesel powertrain options. Chrysler Group LLC sells and services vehicles in approximately 120 countries around the world.